I don’t like surprises. Never did. My life is filled with so many unexpected things, x and y and z factors, that I feel if I have more, I’m not going to be able to handle it. Even as a child I never liked the infamous jack-in-the-box that my friends adored. I like things neat, planned out systematically, wrapped with a ribbon on top. But this is the kind of surprise that shatters long-held belief, that rearranges the world and reduces it to one moment in time. The kind that disrupts my plans for the future, that throws an important factor to my equations that I simply can’t ignore. There are some instances where I enjoy the unexpected. As you might expect, it is when the surprises are good, when they are in sync with what I want. It might not be as grand as winning a million dollars, but they make up those little, everyday joys that gives us strength and hope that, maybe, in the future, the surprises that come along might not all be storms and hurricanes but little bouquets of flowers or glimpses of the sun behind heavy clouds. There is one moment in time that I find to be a perfect example of this. I had expected the worst, and gotten something good instead. It might be small, mundane, insignificant, but for me it painted the future into something beautiful and hopeful. It was 2007. I was on my way to school, which took about an hour by car. There was a heavy rain outside and I couldn’t see what was around me like I always did. The rain smeared the landscape into ugly blobs of color that made me want to close my eyes and forget. Every tree was a trembling stick, every building a sad gray block, and every person I saw braving the rain a reminder, not of my own luck at having a car, but of how bad the day was. I had this belief that when things went bad before ten in the morning, things would get worse as the day went on. I can safely say that I was not a happy person when I arrived at school. I sat next to my friend in class. We talked a bit, but she noticed that I wasn’t feeling it, and as was her custom, went away to mingle with everybody else. I sat leaning against the wall, felt it press uncomfortably into my shoulder blades, and had no intention of moving. I could imagine what I looked like: a child with a gaze that warned everyone to stay away; unmoving, unsmiling, a statue that no one would care to approach. This made it all the more surprising when a girl suddenly plopped on the seat in front of me. She had hair ridiculously long, sleek and black, reaching her waist. She was the girl that my friends and I talked about a lot…we found her to be “too much; too friendly.” I glared at her and sent a mental message to go away, but she merely smiled wider and said something that, in an instant, made my day. Here’s the thing: I’m an artist, and back in my middle school, people who could draw were regarded as champions. “Draw me” and “draw this” followed me wherever I go. I felt misunderstood and a little annoyed, because when I refused their requests they would get mad. I longed for someone to understand. So when this girl said, “I hear you draw. I do, too!” it came as a wonderful surprise. We quickly became friends, and even now, seven years later, she is still one of my best friends. It’s as simple as finding someone who can draw, or realizing that the guy at the coffee shop gave me extra biscuits with my order, or seeing a flower bloom in the cracks of the pavement. For everyone else, this list of little surprises might be silly, but they are wonderful to me. They are tiny building blocks that I hold on to, vehemently, because I can contract them to form the picture of a beautiful future. The other kind of surprise can easily destroy this illusion. With one mistaken swerve of the steering wheel or a few sentences in a health report, these little surprises would come crashing down. And the frightening thing is, the storm is ever-present in our life. But when I find things to be unbearable, when I start wondering why I even bother going through this torment we call ‘life’, I try to remember these little surprises. I bring to mind these silly joys and replay them in my mind. I don’t know why reliving these moments gives me strength and hope, but I guess that’s part of the surprise. It comes as a packet with the confusion and infinite questions, and there is no sense in trying to understand because we just can’t. I know; I’ve tried, and no matter how much I search for the reason why I felt so happy because of the memory of seeing someone hand out free cookies, it’s always, and shall remain, out of reach. But here’s the surprise…when I think about these things, I realize that life isn’t bad. It can’t be Hell, it can’t be torture, when there are good things happening. They might be small (because what are the odds of winning the lottery, anyway?) but they exist, and that is enough. We were sitting at Lincoln Park in West Seattle, with a handful of friends who had gathered for a picnic potluck, awaiting others who would be joining us shortly. A Facebook message came through on my Smartphone from my friend Yousef Munayyer. Hey Jen, just saw some news about a young man from the Shurrab family in khan yunis being the latest victim, Name is Tayseer. Have you heard from Amer recently? Yesterday I had my first 4th of July celebration in the States. It was amazing. First I went on a short hiking trail in Santa Anita Canyon, Arcadia, followed by cliff jumping in Hermit Falls. We got stuck for an hour when we got back (the rangers said something about closing the doors periodically…should have said that before we went in!) but it was fun. We ate cupcakes and chips, blasted some music, and saw some guys play badminton to pass the time. Afterwards, we went to a grocery store and bought some stuff for barbecue at our friend’s house. All around his neighborhood there were massive fireworks. It was amazing to look at. We decided to go look at some more fireworks, so we went to the beach. During the drive through the highway, fireworks kept going up all around us. Headlights blinked in the dark and buildings loomed above our heads (the car was a convertible). For a moment, I felt as though we were in the movies. Fitting, since I live in LA. 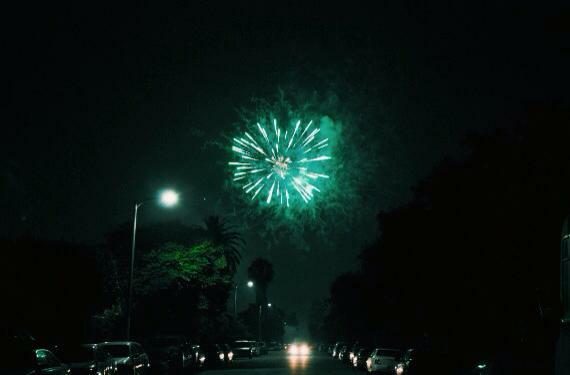 When we got to the beach, the fireworks show was over, but we lay down on the sand and just gazed at the stars. There were many of them to look at because the ocean was really dark. I remember feeling so awed looking at the moon…it was a half-circle, yellow and perfect, flanked by stars in the middle of the sky. The ocean lapped against the shore, calming and rolling. I wanted to jump into the water (I was still wearing my swimsuit under my jacket) but the water was too cold). I wish it could have been like that everyday, but I know that it is impossible. We live not to have fun, but to survive. Sometimes I wish it is not the case, and certainly at times like that it is easy to believe that life will go on like it always did. But I don’t want to feel sad, not after I experienced something so special, so different from what I know (the fireworks here are simply beautiful). By the way, the fireworks up there is a picture my friend took! It was amazing! I find it interesting that when we look at the Universe, we learn more about ourselves. What are we, compared to the greatness of the cosmos? We amount to little more than a speck, but here’s the twist: each of us is a universe in ourselves, and together we make up a world. We make up a home. I took an Astronomy class this semester, because I couldn’t get the class I wanted. The professor’s rating is really low and I didn’t know anything about outer space. I came to class worried, disappointed, and very unhappy; but as I learn more, I began to enjoy it. Now, the professor often talked about this particular scientific show, Cosmos: a Spacetime Odyssey. I wasn’t interested at first, but as my first test approached, I realized that I needed everything I could get my hands on if I hope to get an A. So I started watching it. I learned new things and became more interested with every week that passed. It has been a life-changing experience. One particular line called out to me. It went this way: nullius in verba. Take nobody’s word for it. Test ideas by experiments and observations. Build on those ideas that pass the test. Reject the ones that fail. Follow the evidence wherever it leads, and question everything. Accept these terms, and the cosmos is yours. I ended my class this week, at about the same time that Cosmos aired its last episode. Watching it was a mind-blowing experience. There was this scene of the Voyager spacecraft leaving our Solar System. It turned back at the very last moments before its communication was forever severed from us to take a final look at our Earth. Look again at that dot. That’s here. That’s home. That’s us. On it everyone you love, everyone you know, everyone you ever heard of, every human being who ever was, lived out their lives. I couldn’t agree more. In sixteen mere weeks I have learned more about the Universe, about our own Earth, and about what makes us humans. When we consider the cosmos, we realize how small we are; how truly pathetic and insignificant our dreams, cares, and wishes. When we look at all those other worlds, we discover that there really is nothing like Earth for us; not since the beginning of our existence and not for ages to come. When I look up into the night, at the stars that are more numerous than all the grains of sand on Earth, I wonder why humans are so self-centered, each living in their own illusion that they are most important. 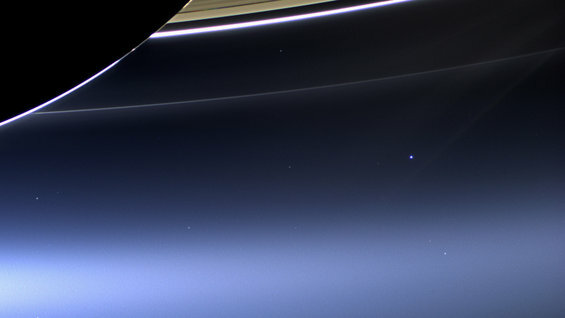 When we look at that pale blue dot, suspended in a sunbeam, let us take a moment to consider our irrelevance and our importance. Let us take a moment to think about all the mysteries we have yet to discover. Let us take a moment to remember that this is our world. We have a responsibility to our home. We owe allegiance to ourselves and to other people. We speak for the Earth. Let us never lose sight of this. Time, money, intelligence. Why is it that everything we ever want is measured in numbers? Ever since the dawn of time, man has been obsessed with numbers. The kings of old would attack bordering kingdoms to magnify his territory. People would count their sheeps and their servants, and the one with most belongings are considered ‘to be envied’. We dreamt of living in houses and building things that reach the clouds. Thus they started counting…how much bricks, how much mortar, how high we can climb the skies. The brilliant minds would wonder at the phase of the moon, at the shadows on the ground, and start counting the years, the months, the days, the minutes, and finally the seconds of our lifetime. And while that has been a blessing, it also comes with a curse. Man becomes the slave of numbers. Nothing is really important unless it has been measured. We work and work to achieve numbers in a paper, which we consequently put in this place called a ‘bank’. Some believe that the more numbers there is, the happier you will be. We never stop because numbers don’t stop. There is no end to our search, and the more we have, the more we realize that they can achieve the impossible, the more we work. We study and study to get the highest mark in our report card. The higher the number, the easier it will be for us to get money, and that will make us happy. IQs are counted, compared, and we are left displeased when we realize that our brother is cleverer, or our daughter is below what society claims ‘average’. We count our days. There is a timer that is ticking for all of us, and while we used to never mind it, as we grow older we begin to hear the ticking. There are so much to do, so much to achieve, and so little time. We try to fill every single moment with things that will make our lives richer, but most of the time we forget that we live simply to live; not to meet the expectations that either we or other people have created, not to get as much money in our bank, and certainly not to count down the moments we have left. Rather than live a long, hollow life, it’s better to have a short but happy one. I recently lost a loved one, but she lived her life to the fullest…loved and was loved, wrote a book, and taught me many things I otherwise would never think of. Don’t forget that there is more to life than numbers. Live and love to the fullest. Keep in mind that our days are numbered and that we have responsiblities, but never forget that life is much more than that.